The city of Barrancabermeja (pop. 300,000 +/-) where the CPT offices are located sits on banks of the Magdalena river. It is a major petroleum processing center with huge refineries and storage tanks. Petroleum products are shipped out by truck and by huge barges going down river (north!) to the Caribbean coast. The Magelena is about 900 miles long, compared to Mississippi’s 2,300, but there is more annual rainfall here. In the area where we are working, the river valley is very wide and the river splits into a large interconnected network of channels that change from year to year and somewhat seasonally. Because there are so few good roads along the valley, the river is a major public transportation route. If you are traveling any distance on the main river you will be traveling by “chalupa”, though not the Taco Bell kind. 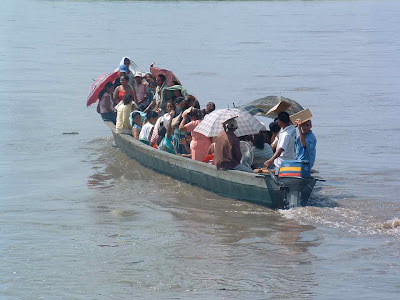 They are the equivalent of a mini-bus, carrying up to 25 passengers and their luggage, rocketing up and down the river to other larger towns where you pick up a canoe to reach the smaller villages along a tributary. The canoes, of course were fascinating to Phil. They range from 20 ft or so to over 60 ft in length, and most are powered by outboard motors. They are basically three pieces of wood, the bottom and two sides, with a few small pieces locking things together at both ends. The idea of using a chain saw to cut out one single board 60 ft long and more than 3 ft wide for the bottom of these larger boats boggles my mind. This is what Julie and her group were riding in when they became hung-up in the weeds and mud. Julie and Stewart left at dawn for the Four Rivers community “Celebration of Life and Resistance to Oppression.” The young people’s organization, Legion de Afecta, requested CPT accompany this two day gathering in rural Colombia as the organization’s young leaders have received multiple death threats this year. Our international presence provides a degree of protection and credibility for the organization. It was a well-organized day of traditional and modern dance demonstrations, public speeches, traditional food, and rituals of healing for the campesinos who have suffered threats and assassinations in the 50 year long Civil War. The night time surge of mosquitoes was intense and Julie has a minimum 200 bites to show for it! 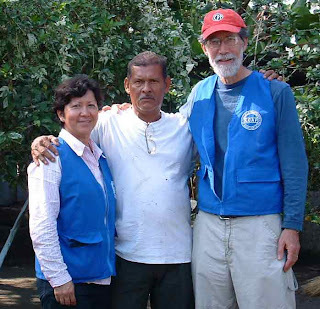 Phil and Gladys left Monday morning for a visit to the villages of Garzal and Nueva Esperanza. CPT currently has five ongoing accompaniments. I had been unaware of the Garzal project. 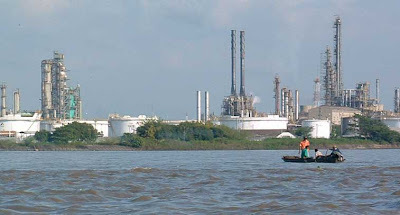 A very brief background is that a cocaine processing plant was set up a couple miles off the river in the early 80 on plantation land sold to a Mr. Barreta in the early 80s. The two communities adjoining the plantation were allowed to stay, even though campesinos rarel have an actual title to their property. In 1989 Barreta was arrested and sent to jail. In the late 90s he disappeared from jail and the communities began to receive threats, telling them they should move off their land as it was being sold to an undisclosed party. The new pastor in town learned through the grapevine that it was Barreta by another name. Salvador, the pastor, tracked him down and asked if they might not negotiate. Barreta refused and added that he expected that the river would be willing to accept as many bodies might be thrown in. Threats continued, some directed personally at Salvador. He decided to stay to support the community. Tension has been escalating since 2001. In 2006 Savador met CPT members at a joint meeting of communities facing displacement. We have been accompanying them since early 2007, assisting in building legal and political networks for them and being present at meeting when the risk of assassination is higher. We try and check in with the community about once a month even if there is no official business. So, Gladys and I went by chalupa to the port of Viajual and then by canoe to Garzal to Salvador’s home. 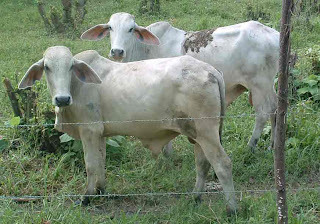 It hot flat river bottom land, where the crops are plaintains, rice, cacao (photo on left) and beef cattle. There are all sorts of tropical fruits as well, of course, many of which I tasted for the first time. My teammate, Gladys, is Colombian and had a great time introducing me to different fruit. I could go on and on about food. After a long interview/visit update with Salavador, we walked up the road and visited with the neighbors. There was an especially fun conversation with two older men at the home of Tomás, an 85 year old who is still farming plantains, coconuts, and cacao. 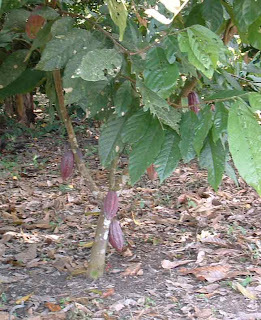 He does bit of wholesale buying, as well, and the other gentleman was there to sell some of his cacao harvest. They talked openly about their frustration with the government’s inability to provide a process in which poorer people can get title to their land. It appears to them (and us) that land titles go to the highest paid attorney. There is hope though. There is a young lawyer that has been working on behalf of the communities for a little more than a year, and there is a new government program has been designed to provide land title access to campesinos. Because the rainy season has recently ended, the mosquitos were not nearly the nuisance on our visit as they were for Julie. ¡Gracias a Dios! Salvador’s family was very kind, and fed us well. We had fun telling stories and singing together. We left the family on Tuesday morning and walked the road/path back down the river toward Nueva Esperanza. I should not here that it was hard for me to know exactly when one community started and the other began. They are small farms strung together along the road. 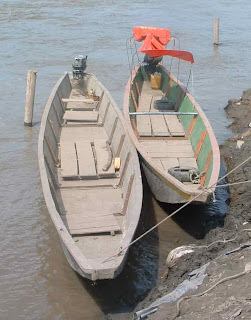 We arrived on the banks of the Magdelena around noon and were back in Barranca for supper. A footnote here is that these farmers are also struggling to compete with hybrid seed being essentially dumped in their markets by the US through the agricultural “free trade” agreement. Salvador stated specifically that he is hoping President Obama will consider altering those agreements to take the pressure off the poorer farmers. Christmas Eve day was supposed to be open for resting, cleaning up, and working on this kind of correspondence. Late in the morning we received a call from one of the families in the Opón River area where Julie has done most of her accompaniment in the past. A man had been arrested the day before, apparently without charge, and was being held here in Barrancabermeja awaiting arraignment. Since we knew his community well and the family somewhat, it was the sort of circumstance in which we can act as spokespersons in a limited way and, at least make sure that the rules are being followed. It turned out to be a classic Opón situation in which the campesino gets stuck in the middle and takes the brunt consequences. Stewart and I were able to get in to visit “John” as he was waiting to be questioned. He said he had been working for a large plantation owner the day before when a group of armed men, whom he took to be guerillas, approached him, handed him an envelope and told him to deliver it to the plantation owner. He figured he didn’t have much choice, so the letter was delivered. For some reason, not only was the owner home, but so was a group of Colombia’s version of the FBI. It turns out the envelope held an extortion letter. John was arrested. Guerillas (the FARC) in the countryside support themselves pirating oil, selling cocaine, and “taxing” the wealthier landowners. In this case, the landowner perhaps was avoiding a payment due. The police can say they arrested somebody. For the larger players, nothing has changed. For John and his family, everything has changed. John’s elderly parents live in his home with his wife and children. John brings in the only cash income. We know of another person arrested in this manner who is still jail waiting trial after three years. We will continue to check in with John’s situation, but are feeling pretty depressed. Merry Christmas seems like a very cynical phrase right now.